Maintaining your Ocellaris 850 Canister Filters was never easier... Keep your Ocellaris 850 / 850uv in fantastic order with our great value genuine Aqua One Complete Renewal Kit. The easiest and most cost effective aquarium maintenance solution, from Aquarium Parts and Aqua One! 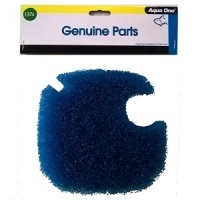 Genuine Aqua One Blue Sponge Pad for use with Ocellaris 850 and Ocellaris 850uv Canister Filters. The 137s Black Sponge traps large particles of aquarium debris and provides a home for beneficial bacteria. Buy from the people who know Aqua One products best. 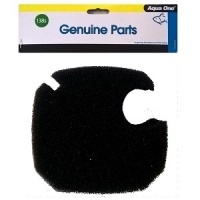 Genuine Aqua One Black Sponge Pad for use with Ocellaris 850 and Ocellaris 850uv Canister Filters. The 138s Black Sponge traps large particles of aquarium debris and provides a home for beneficial bacteria. Buy from the people who know Aqua One parts best. Aqua One White Wool Pad for use with Ocellaris 850 and Ocellaris 850uv Canister Filters. The 137w Polymer Wool Pad traps and removes fine particles of aquarium debris. Change every 4 weeks. These foams will leave your aquarium crystal clear. Genuine Aqua One pump impeller set for use with Ocellaris 850 and Ocellaris 850uv Canister Filters. The impeller comes complete with shaft and end caps and is a direct replacement, identical to the impeller that came with your setup when new. Genuine Aqua One Ocellaris 850 Canister Filter, supplied complete with all necessary filter media and pads, featuring quick release taps and one touch primer and virtual silent running. Suitable for aquariums between 100 to 250 litres. 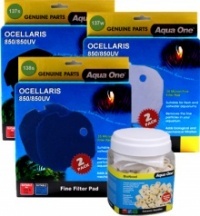 Keep your new AquaVogue 170 aquarium in great condition with a full range of Ocellaris 850 filter media spares from AquaOne. We stock the full range of genuine Aqua One spares and filter components, along with heating, lighting, aquarium decor, cleaning products and more for all AquaVogue setups. It's never been easier to maintain your AquaVogue 245 aquarium in great condition with a full range of genuine Aqua One spares for the Ocellaris 850, along with cleaning products, heaters, air pumps and more, all available for immediate despatch from stock.